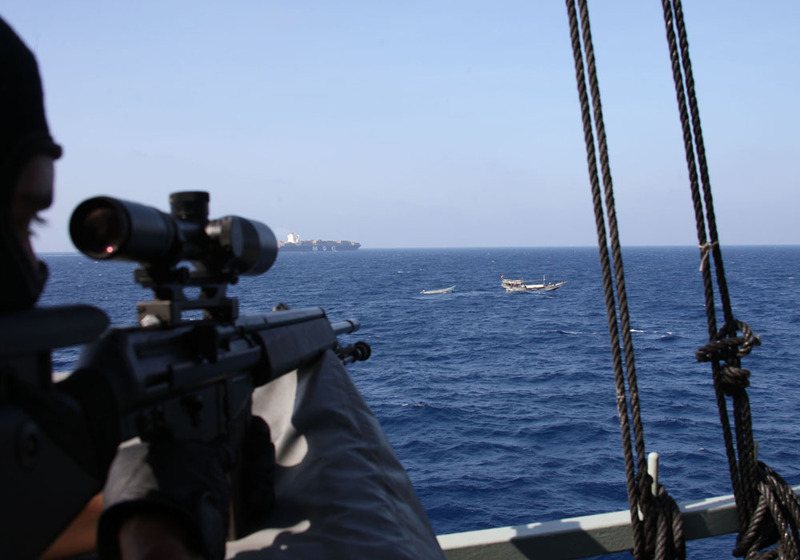 Attacked A piracy alert has been raised by the Maritime Security Centre. Alert number 243 / 2011. At 1053Z 30 Nov 11, Merchant Vessel reported a suspicious approach in vicinity of 1159N 04507E, by 3 skiffs with 2/3 POB each skiff. Two skiffs approached from the stern closing to within 1nm and one from ahead closing to within 2nm. The skiffs did not attack and broke off and moved away from the vessel. The vessel is safe. 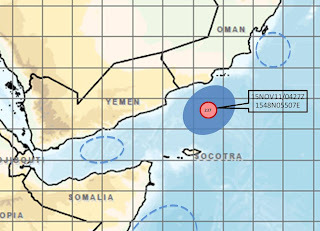 A piracy alert has been raised by the Maritime Security Centre. Alert number 242 / 2011. 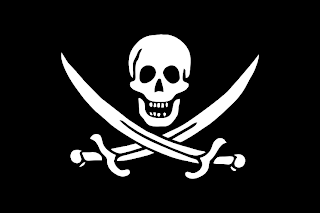 At 0857 UTC / 29 NOV 11 / a merchant vessel is currently under attack by 1 skiff in position 15 02 N 056 39 E.
AMPLIFYING INFORMATION: Pirates attempted to board the vessel, and as of 290902Z Pirates ceased attack. Vessels are advised to exercise extreme caution when navigating within 100 nautical miles of the position given in this report and maintain maximum CPA with any ship acting suspiciously. 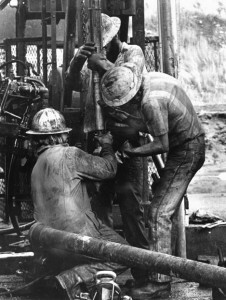 The Utica Shale is a rock unit located a few thousand feet below the Marcellus Shale. It also has the potential to become an enormous natural gas resource. The Utica Shale is thicker than the Marcellus, it is more geographically extensive and it has already proven its ability to support commercial production. 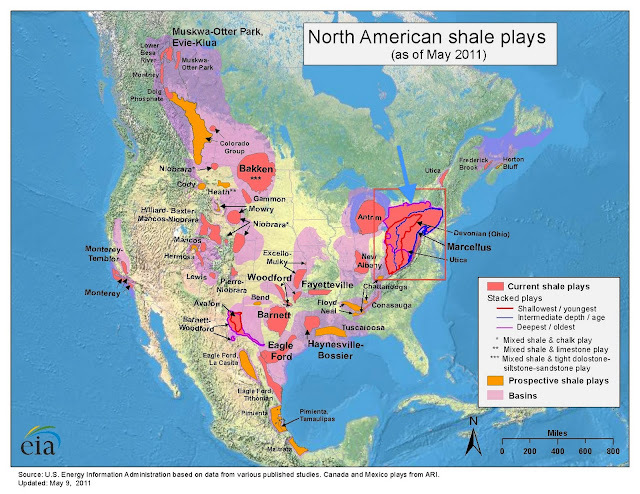 It is impossible to say at this time how large the Utica Shale resource might be because it has not been thoroughly evaluated and little public information is available about its organic content, the thickness of organic-rich intervals and how it will respond to horizontal drilling and hydraulic fracturing. However, the results of early testing indicate that the Utica Shale will be a very significant resource. Where is the Utica Shale? On the map above, I added a red box to the outline of the Utica play, with a blue arrow pointing to what I believe to be the line showing the estimated range. There's a nice map at the Geology.com link. I think we are a lot more "energy independent" than most people believe. Other than union jobs for private employers, all of the kinds of jobs that the Democrats like require the rest of us to pay taxes to that they have the money to pay the salaries for these workers. This is the heart of the problem. Government needs more private workers so that more tax revenue is collected to pay the salaries of Government employees. So it should be an easy task to pass a bill that will result in stimulating the creation of jobs. One problem, Democrats hate most kinds of private jobs. Oh, you know those oil pipeline, offshore oil and gas shale jobs we could have? Those jobs are really hated by the crowd that is trying to "create" a market for more expensive "alternative" fuels - having failed to learn from the ongoing ethanol fiasco (in which, to be fair, the Republicans have played a large part). 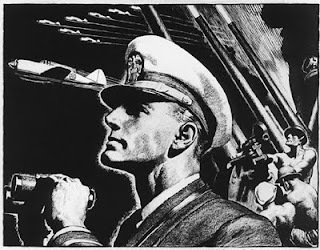 The drug and illegal alien troubles on the border with Mexico are the topic of a disturbing post at Herschel Smith's The Captain's Journal "Border War". Then NBC News report is good and shows the use of boats to move large quantities of drugs. 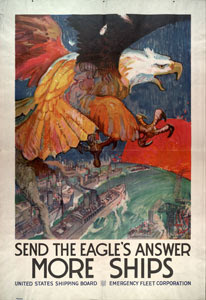 A U.S. Environmental Protection Agency plan for the border here, from whence came the map above. That blue thing wandering the border is not a security zone, but an environmental planning area. "This is the logistics challenge of our generation," says Vice Adm. Mark Harnitchek, deputy commander of the U.S. military's Transportation Command, and a student of military logistics history. "The challenge of my father's generation was escorting convoys across the north Atlantic when we didn't know how to do that very well. 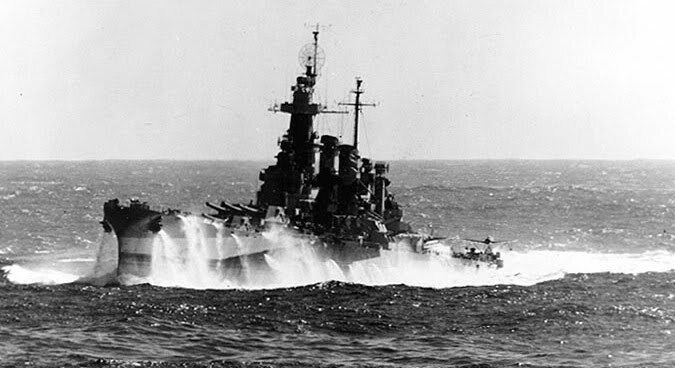 Convoys in 1943 would lose 16 of their 32 ships. The Army had their challenge supplying Patton in his race across France, keeping him resupplied. Supporting operations in Afghanistan is our generational challenge." 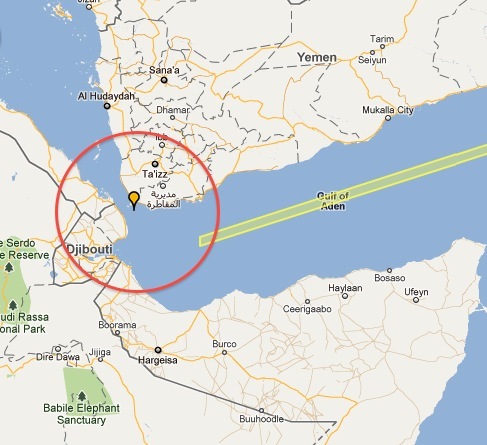 49.58 Suspicious Activity Alert 241 - Suspicious Activity A piracy alert has been raised by the Maritime Security Centre. 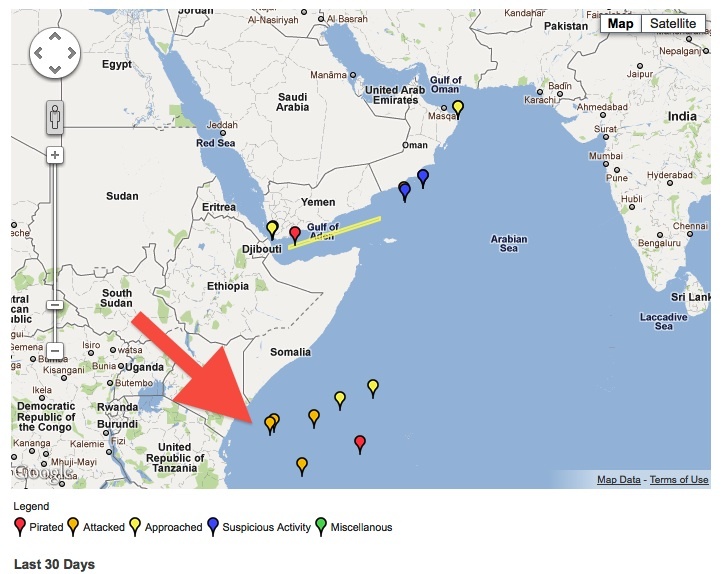 At 1700 UTC / 27 NOV 11 / a Pirate Attack Group consisting of am other vessel and 4 skiffs was reported in position 01 20 S 049 35 E.
At 1010 UTC / 26 OCT / a Pirate Action Group consisting of one whaler and one skiff was reported in position 02 52 S 048 37 E.
NSC has received reports of a single skiff approaching a vessel in the Bab al Mandeb, in position 12 37N 043 26E. it approached to 0.5nm before breaking off and is believed to be loitering in the area. The skiff is reportedly white with a red stripe, and is carrying 6 persons on board. All of us have something to be thankful for, even it sometimes seems that we carry heavy burdens in hard times. Count your blessings. If you are reading this, you are breathing, able to read and have access to the internet. From FY2006 to FY2008 the U.S. Government provided approximately $57 million via the National Defense Authorization Act Section 1206 to support Indonesia’s establishment of an Integrated Maritime Surveillance System (IMSS) strategically located to cover Malacca Strait, Sulawesi Sea, and Moluccas Strait. 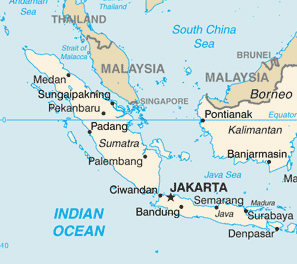 The fully operational IMSS enhances Indonesia’s ability to detect, track, and monitor vessels passing through territorial and international waters. This capability is crucial to combating piracy, illegal fishing, smuggling, and terrorism within and around Indonesia’s maritime borders. The IMSS helps achieve Indonesian and U.S. maritime security goals and exemplifies bilateral cooperation under the Comprehensive Partnership, along with setting conditions for increased multilateral collaboration with Malaysia and the Philippines. The IMSS is a tightly integrated network of ship and shore based sensors, communications devices, and computing resources that collect, transmit, analyze and display a broad array of maritime data including automatic identification system (AIS), surface radar, surveillance cameras, global positioning system (GPS), equipment health monitors and radio transmissions of maritime traffic in wide operating areas. Redundant sensors and multiple communication paths make the IMSS a robust and capable system. The U.S. government remains committed to improving maritime domain awareness in the region and has allocated an additional $4.6 to ensure sustainment until 2014. Trident's Integrated Maritime Surveillance System (IMSS) is designed for governments and other appropriate authorities challenged with demanding Maritime Domain Awareness (MDA) and Common Operating Picture (COP) requirements. 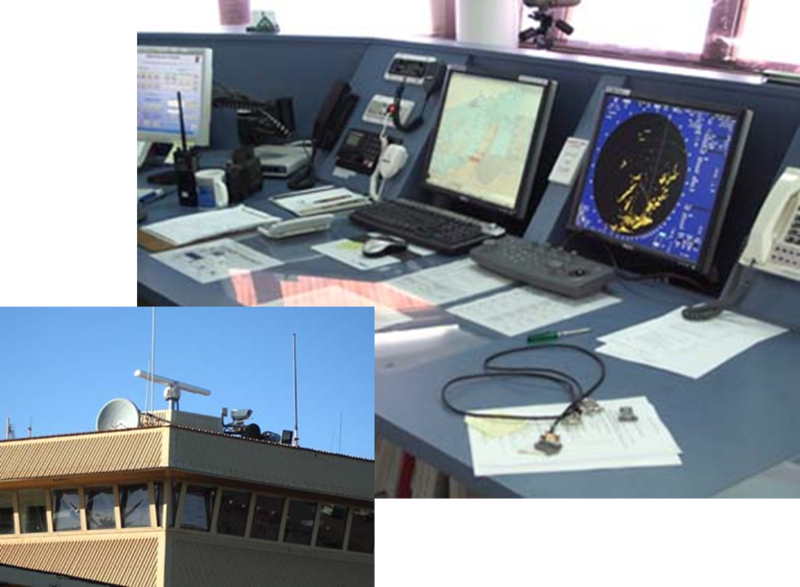 The IMSS is a tightly integrated network of ship and shore based sensors, communications devices and computing resources that collect, transmit, analyze and display a broad array of disparate data including automatic information system (AIS), radar, surveillance cameras, global positioning system (GPS), equipment health monitors and radio transmissions of maritime traffic in a wide operating area. Redundant sensors and multiple communications paths make the system robust and still functional even in the case of a major component failure. The clever open architecture and purposeful use commercial off-the-shelf components provides the customer tremendous flexibility in making performance-cost trade offs today and in making capability upgrades and additions tomorrow. The U.S. presence “bolsters our ability to assert our sovereignty over certain areas,” Ricky Carandang, a spokesman for Philippines President Benigno Aquino, said Nov. 17. Chinese scholars and commentators lashed out with barely repressed anger at President Obama's trip to Asia, complaining that his efforts to shore up U.S. influence in Asia were by implication aimed at containing China. "The United States has alienated 1 billion Chinese. It's not smart public diplomacy," Shen Dingli, a professor of American studies at Shanghai's Fudan University, said Monday. The English-language China Daily in its lead editorial on Monday accused the United States of "scaremongering" over the perceived threat of China's rise and a signed Op-Ed article on Sunday declared, "East Asia not U.S. playground." 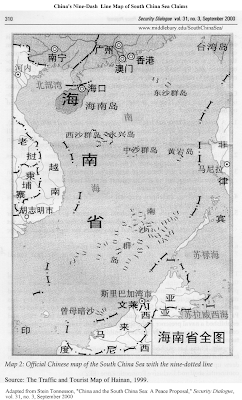 "The aim of America's strategic move east is in fact to pin down and contain China and counterbalance China's development," echoed Jiefang Daily, a Chinese-language version of the official Xinhua news agency, in a commentary on Sunday. 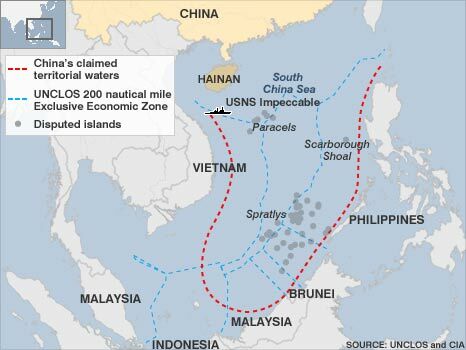 US officials have praised China's attitude on South China Sea territorial disputes after talks between Chinese Prime Minister Wen Jiabao and President Barack Obama. The meeting came after spats between Beijing and Washington over trade, currency and territorial rights in the South China Sea. 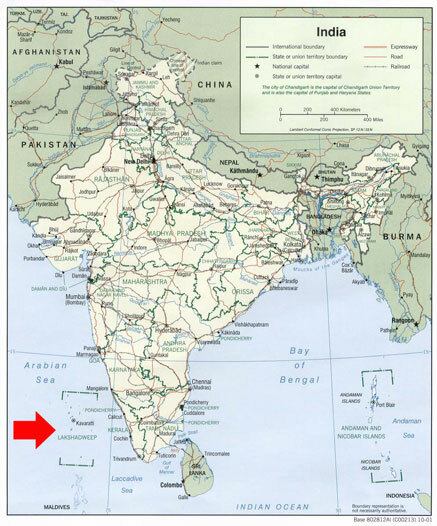 The sea holds potentially vast reserves of oil and gas, and is an important shipping route. 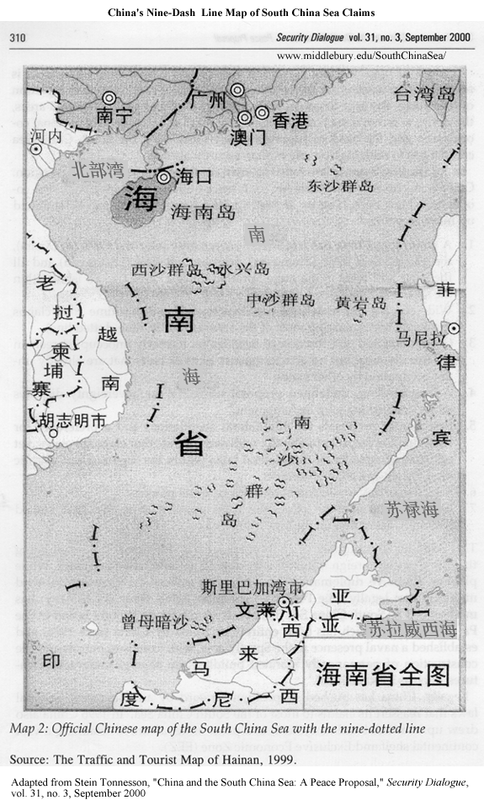 China lays claim to the whole of the sea, while other South East Asian nations claim parts of it. US National Security Adviser Tom Donilon said the "informal meeting" between Mr Obama and Mr Wen focused mainly on economic issues. He said the two leaders discussed "specific issues around business practices" as well as Chinese currency controls. Mr Donilon said the United States did not have a view on sovereignty on the South China Sea, but wanted to see shipping lanes remain open. "We don't have a claim, we don't take sides in the claims, but we do as a global maritime power have an interest in seeing these principles applied broadly," he said. 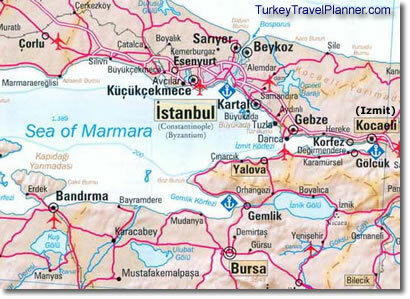 Take a look at the maps. 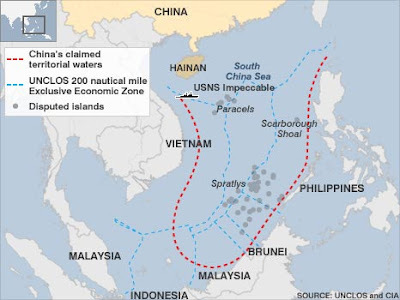 They both mark the Chinese South China Sea claims and the color map, in addition, marks the claims of those of the South China Sea littoral nations, including the very allies which Mr. Obama promised to support, including the Philippines, our "treaty ally" so comforted by the earlier speeches. How the National Security Adviser can say, "We don't have a claim, we don't take sides in the claims . . ." is beyond me. Those are the sort of words that lead to the invasion of South Korea 61 years ago. If we are drawing a line in the sands of the Pacific, it has to be a much firmer line than that. For those who listen to All Things Considered on NPR, earlier this month you caught an outstanding series on the 3rd Battalion 5th Marines – the Darkhorse Battalion — the Marine unit that suffered the highest casualty rate of any Marine unit during the 10-year Afghan war. Our guest for the full hour is the journalist who brought the American people that story - Tom Bowman, NPR National Desk reporter covering the Pentagon. Before coming to NPR in April 2006, Bowman spent nine years as a Pentagon reporter at The Baltimore Sun. Altogether he was at The Sun for nearly two decades, covering the Maryland Statehouse, the U.S. Congress, the U.S. Naval Academy, and the National Security Agency (NSA). The show link is here. You can also download the program there (shortly after we finish on air) for later listening. Or you can find Midrats on iTunes. 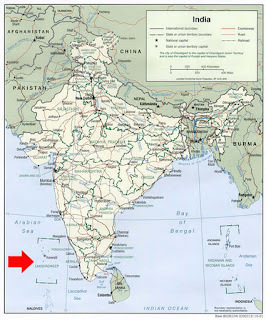 This is a blog that mostly deals with maritime and national security. However, in addition to sea piracy, there are people out there who hijack other people's money just as pirates hijack ships - and this hijacking has an impact on our national security in the economic sphere. Why Mr. Corzine is not under arrest is a mystery to me. Arrest him for suspicion of theft and then sort the mess out. As the woman in the cartoon above knows, when a ship sinks, someone has to be called to task. The writer offered the broker a deal, "If I invest my life's saving with you, I only ask one thing." Writer: "If you lose my money, I get to kill you." Writer: "Look, my whole working life and the future lives of my wife and children are wrapped up in that money. If it is gone, my working life as been wasted. Don't you think it fair that in exchange for giving you my life's work, you should offer up something in exchange for me investing in your 'sure thing" - and I think your life would be a fair exchange." The broker hung up the phone. I'll try to track down the original column, but I think I captured the essence if not the quality of writing. The bigger point is, however, that these money managers - who make money coming and going - need to have something real at risk - instead of just a sullied reputation. While execution may be too harsh, breaking rocks in the hot sun might not be. So, while I may not have chosen all the words Ms. Barnhardt used, her speaking "truth to power" and in going "John Galt" is worthy of note. 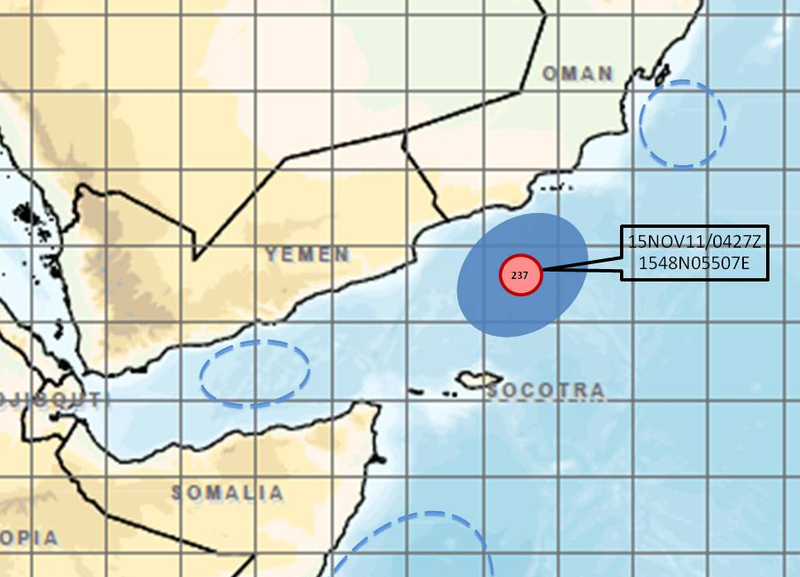 AT 0450Z 18 NOV A PIRATE ACTION GROUP CONSISTING OF 1 SKIFF WAS REPORTED IN POSITION 1233N 04333E. MORE THEN ONE MV REPORTS BEING ATTACKED. 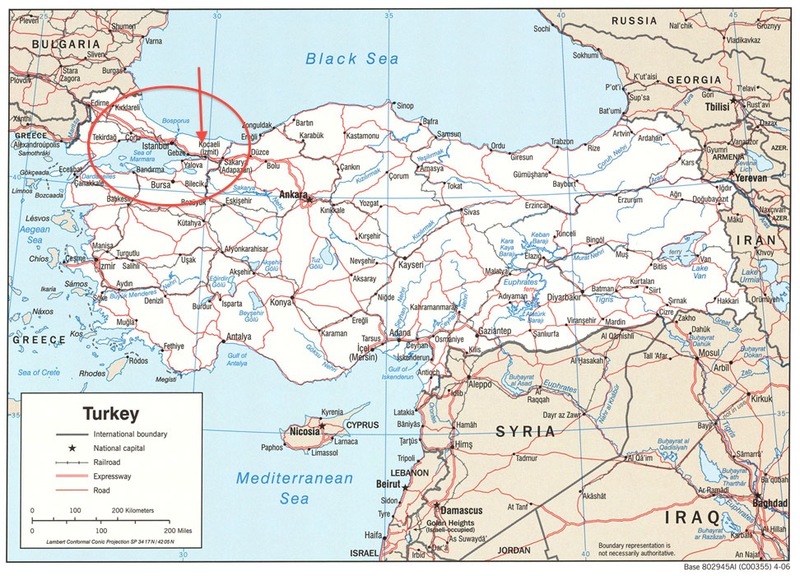 Map is a portion the NATO alert map, with a red circle I added to highlight location. Merchant ships in the area ought to run the skiff over. The government's political and economic failures are not the only cause of the malaise that now threatens Italy's survival. Some flaws in the national structure were inherent in the circumstances of the country's creation. The Northern League -- Italy's third-largest political party, which suggested that the country's 150th birthday in March should be cause for mourning rather than celebration -- is not simply a bizarre aberration. Its attitude to the south, xenophobic and even racist as it sometimes is, demonstrates the truth that Italy has never felt itself to be a properly united country. Worth a read, especially if you haven't thought about what a recent (relatively) construct Italy is. What might happen if Italy falls apart? Revival of Piedmont, Tuscany, Lombardy, Venice and the kingdom of Naples? Or might this current crisis cause the country, despite, Mr. Gilmour's words, to pull together or attempt to do so? Do the regions all hang together or wither separately? Go full Balkan or cobble together alliances? Chinese Shipping company Freezing Payments. What's it all mean? Chinese shipping company not paying ship owners? Is it because their demand is down and they don't need to be especially nice to the ship owners to ensure they can get ships in a tight market? Because they know there's too many ships chasing too few charters? 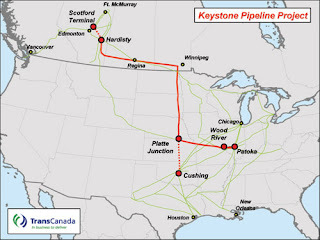 “Did the Administration punt on Keystone because there are more Solyndras out there dependent on high oil prices and Alberta oil threatens to lower the price enough to put more of them out of business? "You don’t need a weatherman To know which way the wind blows," Dylan once wrote. How else do you create a market for overpriced fuels and products? Jack up the prices and costs of your competition. In private business it would be a violation of the law. Apparently, in government when the goal is "saving the planet" there are no rules. So we see the Department of the Navy getting into the "market creation business" for an unproven business (or, as the insiders put it, "investing in"). Of course, "investments" are always better when the fix is in. But, as Solyndra proves, sometimes the "fix" doesn't take. Which means, with private investors the investors take a bath. With taxpayer money? 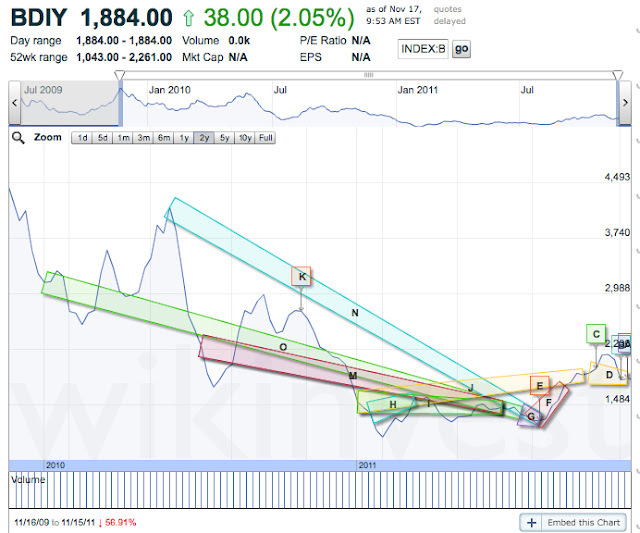 It was just "unexpected" that competition could drop the price model of Solyndra into the garbage pit. A "global oversupply of solar panels?" Surely, someone should have been monitoring the market before a ton of money was "invested?" Half a billion here, half a billion there, pretty soon you're talking real money. Raytheon and Emirates Advanced Research and Technology Holding (Earth), its UAE partner, see potential application of the Talon laser-guided rocket to take on small boats. 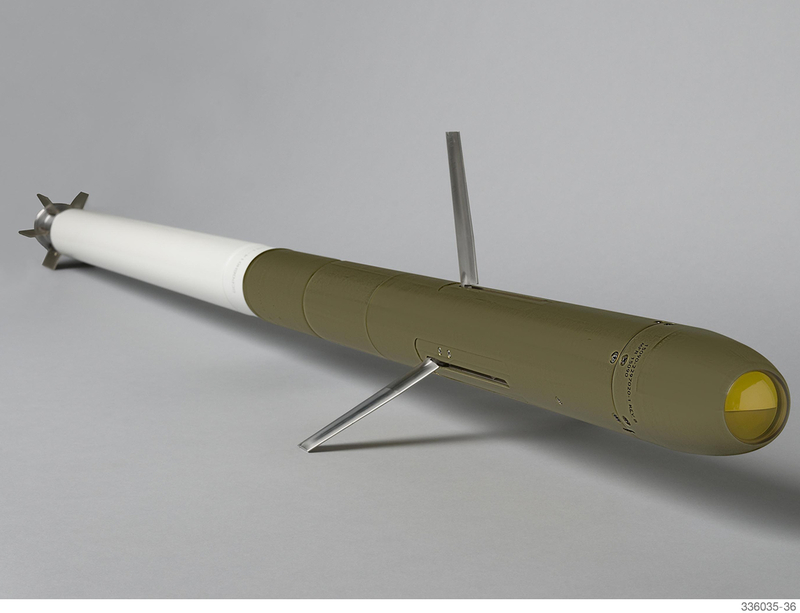 TALON is a low-cost, semi-active laser guidance and control kit that connects directly to the front of 2.75-inch unguided rockets currently in U.S. and international inventories. 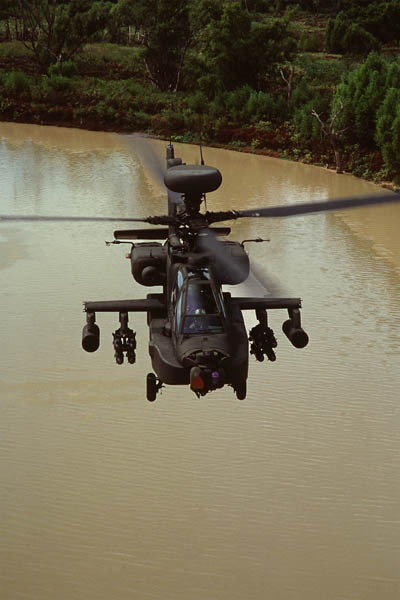 It has been designed to fill the critical operational gap between unguided rockets and guided heavy anti-tank missiles. TALON provides an effective weapon against soft to lightly armored point targets while reducing potential collateral damage. Moreover, its precision standoff range results in improved platform survivability. 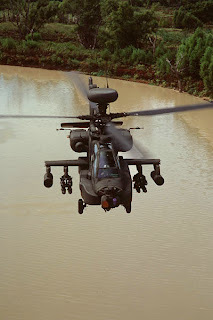 These rockets were designed for the AH-64 Apache, but it seems that Raytheon and its partner are thinking it could work on other platforms, too, as well as being capable of targeting small boats instead of just armor and land stuff. Particularly well suited for force application and situational awareness roles in asymmetrical warfare theatres of operation, the AT-802U is both economical and effective. 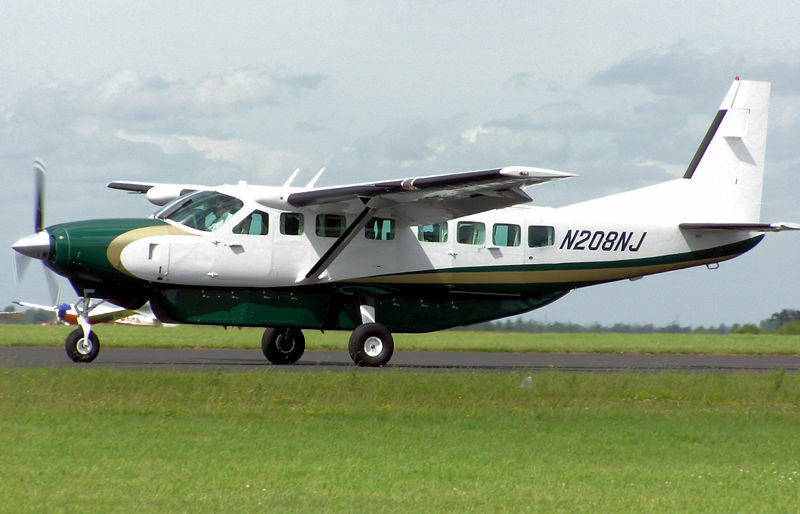 Like a truck, the aircraft is utilitarian in nature: tough, powerful, and configurable to simply get the job done. It can maintain very long endurance over target and can employ a wide range of weapons simultaneously, with a high degree of accuracy to minimize collateral damage. 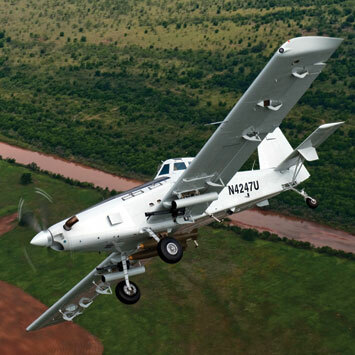 With its balloon tires and rugged landing gear, the AT-802U is built to land and operate off unimproved airstrips – even dirt roads – providing unprecedented direct support and coordination with ground troops. The AT-802U can fly in extreme heat and dust conditions and with its massive fuel reserves, loiter over target to find, fix and finish when other fighters have to return to the tanker. Pilot and sensor operator on the AT-802U. Wonder how they'd do off and on a small flight deck? Our intent is not to point fingers. Our goal is to make it clear that these are large, complex issues that must be addressed with rigor, intellectual honesty and sophistication about the broader foreign policy and economic implications. Defense spending is not arithmetic, it is calculus—and it is hard. Hard work is not what Congress is noted for, so the unasked question is whether or not there are enough grownups in DC with the highlighted skill set to make mature decisions and avoid the "business as usual" drill? Is this a self-answering question? Alert number 237 / 2011. At 0427 UTC / 15 OCT 11 / a merchant vessel is currently under attack by 1 skiff in position 1551N 05507E. Attacked vessel reported possible mothership location 1548N 05507E. Unconfirmed. They share the hazards, smell the smells; all that is needed so that those at home may understand what their countrymen are doing in the far reaches of the world on their behalf. The best know that to tell a story, you have to be in it. Sometimes, the story catches up with them. Our guest for the full hour will be Kimberly Dozier, foreign correspondent for CBS News Radio specializing in the Middle East from the disputed territories of Israel to the war in Afghanistan and the hunt for Osama bin Laden. 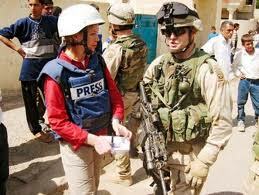 She reported on the war in Iraq from 2003 until she was injured by a car bomb in 2006. She recently returned to Afghanistan and Pakistan as an Intelligence/Counterterrorism correspondent for the Associated Press. 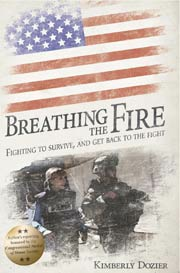 She is also the author of Breathing the Fire, the story of her recovery from her injuries in 2006. Also you can listen on iTunes or BlogTalkRadio - Midrats or by downloading from either location. Over the past two years, the federal stimulus program paid the owner of a Colorado-based energy company and the company’s Wyoming representative more than $1 million in salaries and benefits for a Department of Energy carbon storage study in Wyoming’s Powder River Basin, according to records obtained by WyoFile under the Freedom of Information Act. Federal pay invoices show that Michael J. Ruffatto, founder and CEO of North American Power Group Ltd., based in Greenwood Village, CO, received $955,343.29, and Brad Enzi, NAPG’s Cheyenne-based representative and son of Wyoming US Sen. Mike Enzi, $128,394.73 for the Two Elk Energy Park Carbon Site Characterization project from September 2009, when the study began, through July 31, 2011, the last date for which records were available. According to the National Recovery Act Transparency and Accountability Board, Ruffatto and Enzi’s compensation is nearly 20 percent of the total spent so far on the project. Overall, the price tag of the Two Elk carbon site characterization project is nearly $10 million — $9,949,962.00. Its purpose is to determine if the sub-surface geology of the Powder River basin is suitable for storing CO2 produced by power plants and other industrial sources. The project was awarded two grants from the DOE National Energy Technology Laboratory. It is part of the Obama administration’s National Recovery Act stimulus package aimed at jump-starting the economy and creating new jobs. Rather than creating new jobs, Ruffatto reported, a percentage of his and other North American Power Group employees’ wages were paid for with stimulus funds. He estimated that, in addition, 15 “indirect jobs” and 60 “induced jobs” have been created by the federal stimulus money. 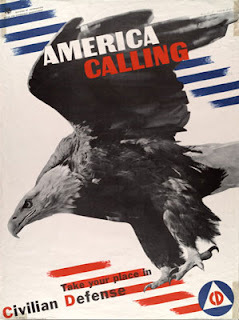 The timing of the stimulus grants was particularly good for North American Power Group. The company had seen a series of setbacks to its ambitious – but long delayed — $1 billion, 320-megawatt Two Elk power plant project 40 miles southeast of Gillette. North American owns four smaller operating power plants in California, but the Two Elk plant on 880 acres in Wyoming is to be its showcase project. At one point, Ruffatto told investors of plans to build seven power plants on the Two Elk site — biomass, coal and natural gas — to provide power to Colorado and the American Southwest. Had the dream been realized, he would have commanded a sizeable private utility. The latest blow to Two Elk came this spring, when an IRS audit determined that not enough progress had been made on the plant for North American to continue to qualify for tax exempt status on the $445-million in Industrial Revenue Bonds the company holds. The bonds had been sponsored by Campbell County and approved by successive Wyoming governors — Republican Jim Geringer and Democrat Dave Freudenthal. The bonds were issued in 2007 by Campbell County under a creative interpretation of the US Tax Code that classified the coal-fired Two Elk power plant as a “solid waste disposal and recycling facility” because the promoters, North American Power Group, said they intended to burn “waste coal” from the giant nearby Arch Coal and Peabody Coal mines. “Waste coal” is coal that mining companies judge not worth the cost of interstate rail transport to power generators. It is generally reburied at the mine site. Because interest received by tax exempt bondholders is excluded from gross income, the bonds were originally a major selling point for the power plant project. Approved in 2009 and 2010, the federal stimulus grants to North American Power Group allowed Ruffatto to use federal funds to pay a significant portion of his own salary and that of several of his key employees, including Enzi, while waiting for conditions to improve for the construction of the Two Elk power plant. 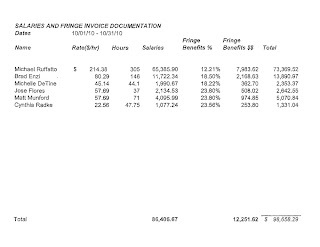 Ruffatto bills the government $214.38 an hour as “chief investigator” for the stimulus project. Both he and R. Paul Detwiler, chief counsel for the National Technology Energy Laboratory that awarded the stimulus grants, defended the payments to WyoFile as being consistent with the nature of the work and qualifications of the North American Power Group employees. This includes Brad Enzi, a 1997 University of Wyoming journalism-communications graduate and former Washington, D.C., lobbyist, who is paid $80 an hour from the federal stimulus grant, DOE documents show. Ruffatto, 65, said in a telephone interview that his hourly rates were worked out in advance with DOE and, in his case, represented a “discount” from his normal rate of pay as chief executive of a regional energy company with offices in Colorado, California and Wyoming. 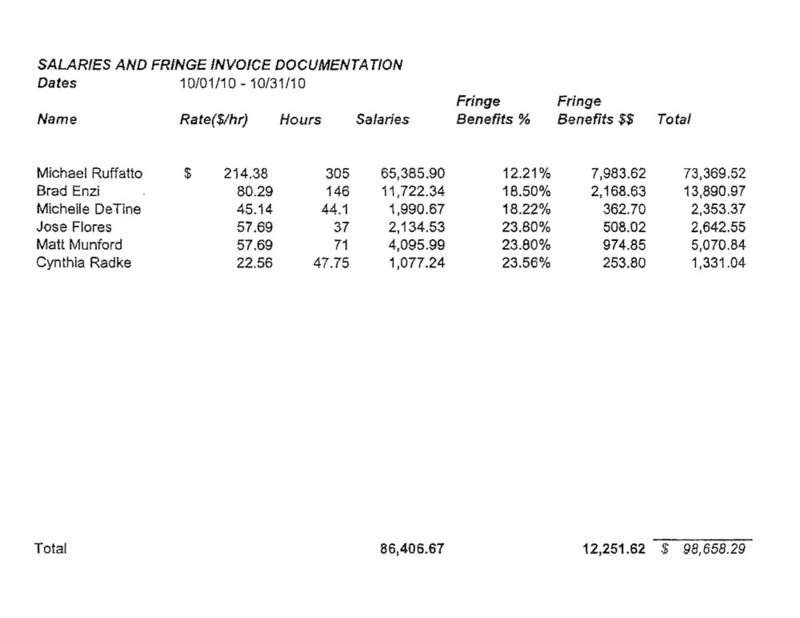 In one month alone — October, 2010 — Ruffatto was paid $73,369.52 in salary and benefits from the stimulus funds, according to the invoices obtained by WyoFile. Ruffatto reported working 305 hours in that month — or 76 hours a week— for the stimulus project, while also performing his other duties as CEO of North American Power Group. Shipping firms which place private armed security guards on ships passing areas where pirates operate risk criminal prosecution, justice minister Ivo Opstelten said on Thursday evening. Jumbo Shipping from Rotterdam and Vroon Shipping based in Breskens have both said they will carry armed guards while sailing under the Dutch flag. 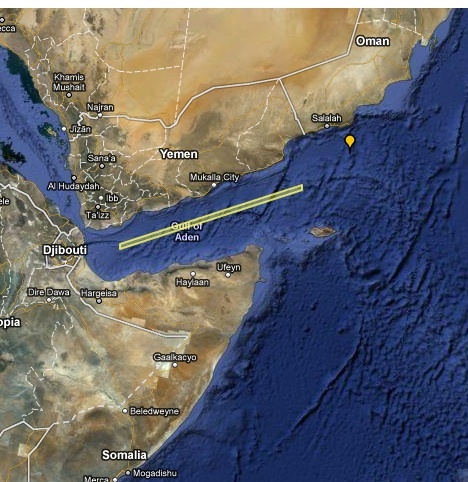 Just one more complication in the battle against Somali pirates. No wonder the Jolly Roger has a smile on his face. 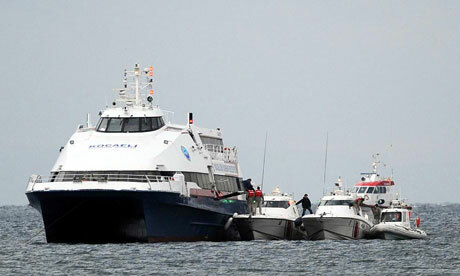 Authorities say Turkish commandos stormed a hijacked ferry Saturday and killed the lone hijacker. Istanbul Governor Huseyin Avni Mutlu told reporters Saturday that the crew and passengers were all safe, and the identity of the hijacker is still being determined. Earlier reports said up to five suspected Kurdish militants armed with explosives carried out the hijacking. The ferry Kartepe was carrying 18 passengers, including five women, along with four crew members and two trainees. It ran out of fuel Friday after sailing from Izmit and dropping anchor in the Sea of Marmara, where it was reported commandos boarded the vessel. Turkish media reported that the ferry was traveling between Izmit and the town of Golcuk in Kocaeli province Friday evening when the vessel was seized by militants. 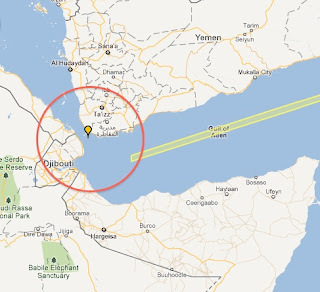 The Indian Navy patrolling the Gulf of Aden on Thursday thwarted a multi-boat attack by sea brigands on merchant vessels, apprehending 26 Somali pirates and confiscating arms and ammunition, in the fifth successful anti-piracy operation since September. At 9.25 a.m. on Thursday, navy personnel aboard warship INS Sukanya spotted a group of five suspicious boats speedily approaching the merchant vessels of her group. 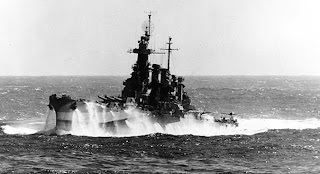 “The warship immediately altered (its direction) towards the suspicious vessels and challenged them. 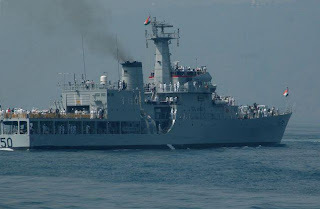 On seeing the resolve evident in the warship’s action and probably mindful of the reputation for resolute action that the Indian Navy justly enjoys in such deployments, the pirate skiffs reversed course and tried to flee the area,” Captain Manohar Nambiar, Chief Public Relations Officer, Defence, said. While two of them managed to escape, INS Sukanya successfully intercepted the remaining three boats and, in a well-practiced and professionally executed boarding-and-search action, nabbed 26 Somali pirates with six AK 47 rifles, 12 magazines and about 300 rounds of ammunition. 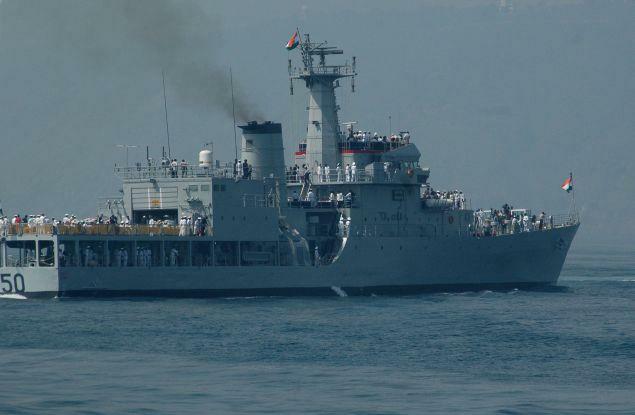 This is the fifth successful anti-piracy operation conducted by INS Sukanya in the course of her ongoing patrol mission in the Gulf of Aden that commenced in September, the Navy said. More on the Sukanya-class of offshore patrol vessels here. Somali Pirates: Kenya's Punitive Expedition Hurting Their Business? Kenya’s operation against Al Shabaab in Somalia has helped reduce ransom demands on captured ships as pirates seek to close deals before a battle between the militants and Kenyan forces at Kismayo. Shipping experts said that the amount of ransom demanded by pirates for vessels had dropped by about 50 per cent and could fall further in coming days once “Operation Linda Nchi” (Defend the Country) is completed. “Initially, the pirates holding captive the Algerian flagged MV BLIDA were demanding $6 million to release the vessel and her multi-national crew. But a package of $3.5 million was delivered on the vessel and they freed it,” said Andrew Mwangura, the Seafarers’ Assistant Programmes (SAP) coordinator. 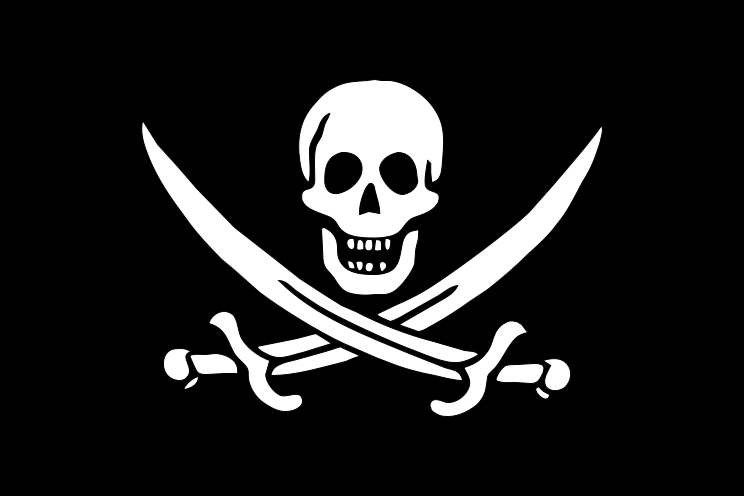 It is believed that the militants offer protection to pirates in exchange for cash, arms and logistics in a pirate value chain estimated to be worth between $4.9 billion and $8.3 billion. Maritime sources privy to ransom negotiations in Mombasa said the military campaign had tilted negotiations in favour of vessel owners as pirates rush to close deals. Most of us who have been watching the Somali pirates for any time have noted that the key to their defeat was on the ground in Somalia. 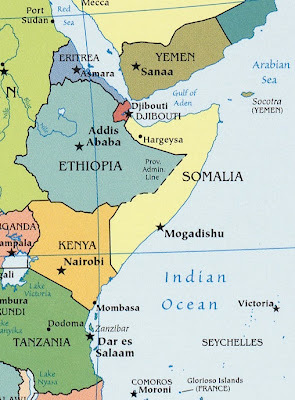 Kenya and Somalia governments on Tuesday declared militant group Al-Shabaab, which has been terrorizing residents of the two neighbouring nations a "common enemy" and vowed to subdue its fighters. In a joint communique issued in Nairobi after a meeting between the two governments in Mogadishu earlier on Tuesday, the two sides agreed to develop a common political and security strategy to address the threat posed by the militia. "The two sides agreed to continue working together to stabilize Somalia and to stamp out the threats of the Al-Shabaab elements, especially terrorism, piracy, abductions, extortion, ransom demands and other international crimes," the joint statement said. The meeting in Mogadishu was attended by Somalia President Sheikh Ahmed Sharif and Kenyan delegation led by Foreign Minister Moses Wetangula and his Defence counterpart Yusuf Haji. During the meeting, the two sides agreed to cooperate in undertaking security and military operations in the Lower Juba regions of Somalia and to undertake coordinated pre-emptive action, and pursuit of any armed elements that continue to threaten and attack both countries. "In this regard, both sides agreed to revamp the joint mechanism to ensure enhanced cooperation and coordination in all aspects," the statement said. 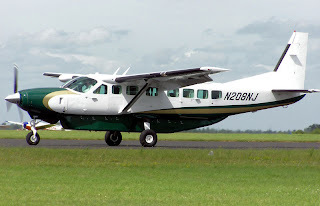 This provides cover for the Kenyan incursion, which began shortly after intruders from Somalia began assaulting the Kenyan coast and kidnapping aid workers and killing and kidnapping tourists from beach resorts. See here for background. Al-Shabaab has also been active in Kenya, working to destabilize that country, too.
" . 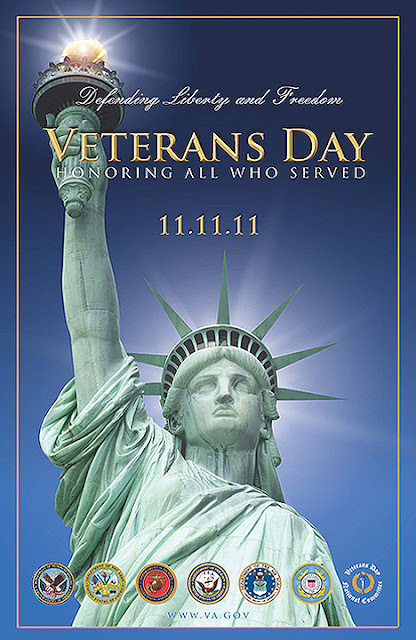 . .[A]ny man who may be asked in this century what he did to make his life worthwhile, I think can respond with a good deal of pride and satisfaction: 'I served in the United States Navy.'" 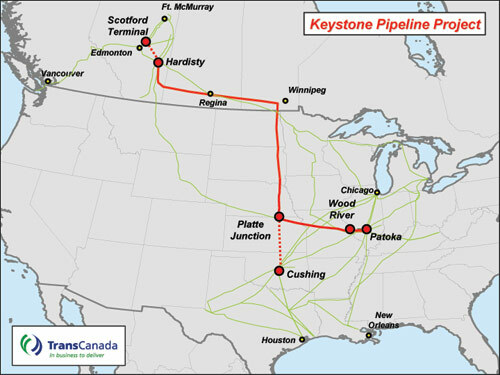 If, years from now, we look back and need to blame an administration for further screwing up our energy business and economy, we can look back at decisions like this: State Department delays Keystone XL decision until 2013 - Oil & Gas Journal. You know, after the election. US oil industry and general business trade associations lashed out at the decision. American Petroleum Institute Pres. and Chief Executive Officer Jack Gerard complained about a political dimension of the decision. “Whether it will help the president retain his job is unclear, but it will cost thousands of shovel-ready opportunities for American workers” he said. “There is no real issue about the environment that requires further investigation, as the president's own State Department has recently concluded after extensive project reviews that go back more than 3 years. Somewhere, some idiot "environmentalist" is happy, since the last thing he understands is where energy comes from. I doubt that idiot knows that pipelines already run across our country and Canada. Meanwhile the President will waste more fuel and pollute more to attend the "carrier game." I guess he figures that he needs the environmental votes more than the U.S. needs jobs and this energy project. Way to put the country first, Mr. President. 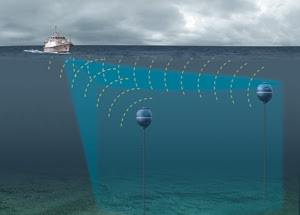 General Dynamics Canada today announced the release of TrailBlazer, a high-frequency, high-resolution sonar system specifically designed for mine and obstacle avoidance (MOAS) on patrol vessels, corvettes, frigates and destroyers operating in littoral waters. TrailBlazer combines wideband transmissions, high directivity and an advanced operator interface to provide superior detection capability against mines and other threats to shallow-water operations. Glad to have them by our side. 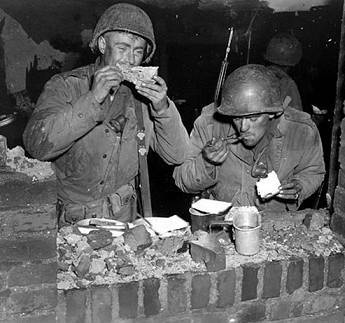 Happy Birthday, Marines! Okay, here's challenge to you all. The NROTC almuni association at my old university is looking to load up Kindles or flash drives or some other media with books that every young officer ought to have in his library - with the rub that most (read "all") of them need to be free. I know there are lot of other good reading materials out there that would make a nice library for these mids as they move into the fleet - pdfs like "One tribe at a time" and lots of other Navy and Marine official history type things that can be downloaded. My question is this - what other books, writings, training manuals, etc, should I be looking for? Further, if you can, can you cite to a location? If you have a couple of ideas that might cost a little, but are really important, toss those out, too. Cargolaw.com, a product of The Law Offices of Countryman and McDaniel is one of my frequent reads. Why? Because it is full of good stuff relating to maritime and transportation law and much, much more, including some absolutely amazing pictures of various shipping, transport and aviation disasters. In addition, it is home to some awful headline puns and the occasional humor shot that causes me to spray coffee all over my keyboard. For example, after viewing pictures of mishaps, I ran across the following picture of a sign, which may, in reality, be some tort defense lawyer's dream of the ultimate warning label. Well, except for the fine print. Okay, I know the sign thing has been on the internets for years, but there is always one new victim out there somewhere. Today it was me. 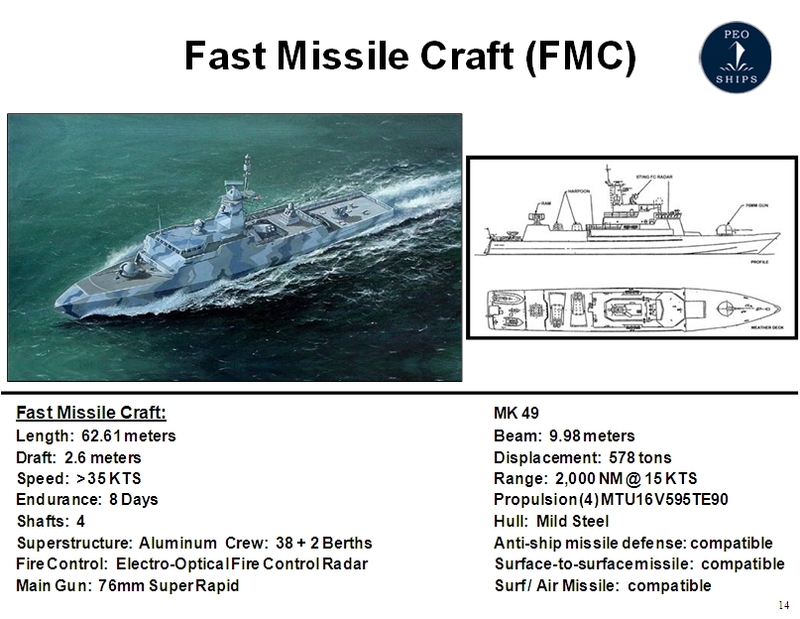 VT Halter Marine, Inc. . . . held a dedication ceremony for the first of four Fast Missile Craft (FMC) built for the Egyptian Navy at its Pascagoula shipyard . The keel for this first FMC was authenticated on April 7, 2010. The FMC is designed to perform coastal patrol, surveillance, interdiction, surface strike and naval battle group support. The vessels will allow the Republic of Egypt to maintain security of its coastal regions for both itself and friendly countries, while denying access to the areas by any potential adversaries. Each FMC will be approximately 62m in length and will incorporate ship signature control technology. High speed and maneuverability are two of the ship’s primary assets to fulfill these roles. 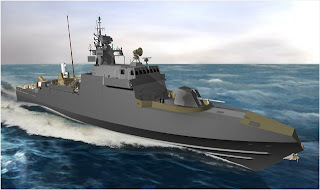 The vessels will also incorporate numerous combat system assets and electronic sensors, equipping the vessels with capabilities in anti-aircraft, anti-surface and electronic warfare. The primary mission of the FMC is to conduct independent and joint operations, primarily against armed surface adversaries. The Egyptian Navy has a requirement for a vessel with the capabilities of an FMC to combat these threats and to patrol and defend its coastal waterways of the Red Sea, Mediterranean Sea, and in particular, the Suez Canal. 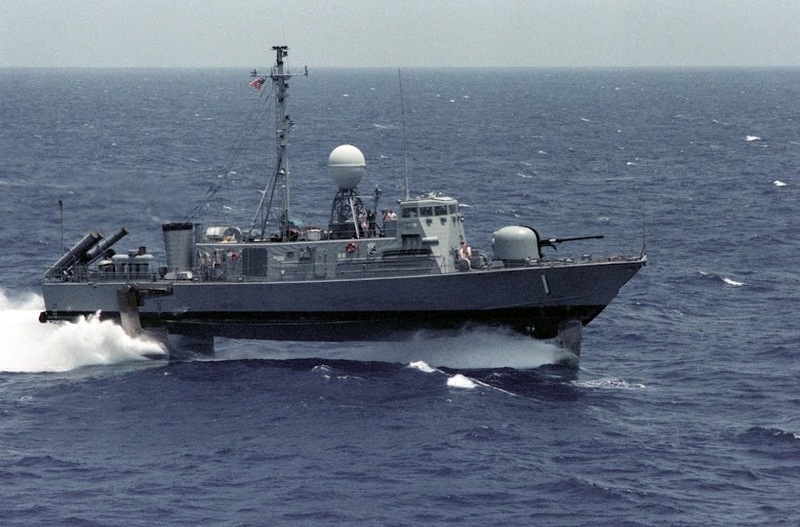 Each of the 63 meter craft carry a 76mm Super Rapid Gun, Harpoon Block II missiles, MK49 Rolling Airframe Missiles, and the Close-In Weapon System (CIWS) Block 1B. These high-speed, agile craft can reach speeds of greater than 34 knots provide berthing for a crew of up to 40 sailors and operate up to eight days independently at sea. 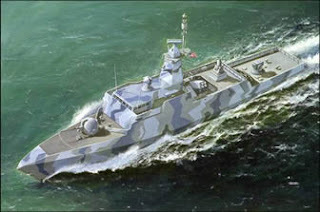 The first of four FMCs are scheduled to join the Egyptian fleet in 2012. 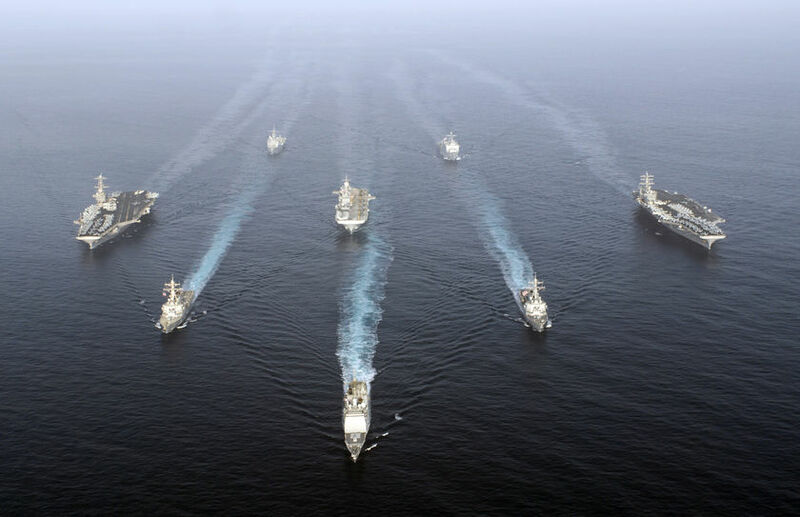 PEO Ships will continue to assist with acquisition and oversight efforts throughout the construction process and will provide follow-on technical and training support to the Egyptian Navy upon delivery of the vessels. I added the emphasis above. UPDATE: Yes, small ships, heavily armed, short-legged. I got that. Less expensive for littoral warfare (surface) than another model which shall remain unnamed here. In a squadron of 5 or 6, joined by armed helicopters and a "mother ship" - they would be nice to have in the green and brown waters for asymmetric stuff. I see putting a few in the Med, Guam, Pearl, Singapore, Bahrain, "Africa Station" and the Gulf of Aden (East African littorals) for counter pirate ops.